Produktinformationen "Dedicated Nutrition IG-One 50 Kapseln"
IG-ONE wurde entwickelt, um große Mengen an Kohlenhydrate und Proteine direkt in die Muskelzellen zu transportieren. Die Erhöhung der Nährstoffzufuhr wird dazu beitragen, den Muskelaufbau, Appetit, Muskelpump zu steigern und die Durchblutung zu erhöhen. Zusätzlich soll Dedicated IG-ONE das Körperfett reduzieren. IG-ONE™ was developed to drive massive amounts of carbohydrates and proteins directly into muscle cells for immediate results you can both see and feel. The insane increase in nutrient delivery will help increase lean mass gains, decrease body fat, increase appetite, increase muscle pump, increase strength and also increase vascularity. Insulin, not testosterone is the human body’s strongest performance increasing hormone. By using IG-ONE™ Insulin’s true potential can finally be harnessed. Most athletes that have a hard time either loosing body fat or gaining muscle have unbalanced Insulin levels. IG-ONE™ levels the playing field by increasing and prolonging Glut4 activation. Glut4 is a unique transponder that triggers carbohydrate and protein uptake into muscle cells instead of fat. Finally carbohydrates and protein can be eaten in large(r) quantities to instantly fuel performance and ignite muscle growth. This Indian herb has traditionally been used for thousands of years for the treatment of diabetes. Banaba contains many active ingredients that are responsible for its incredible usage for athletes. However if a Banaba product is not properly standardized it will contain zero or no active ingredients, rendering the product completely useless which is typically the case! Our unique Banaba Leaf extract is not only incredibly rich in Corosolic Acid, but also in various other flavonoids as well as Ursolic Acid and Anthocyanins. A traditional Indian herb that has been used for thousands of years as well. Extremely high amounts of Gymnemic Acid and various other Saponins are mainly responsible for this herbs potent results. 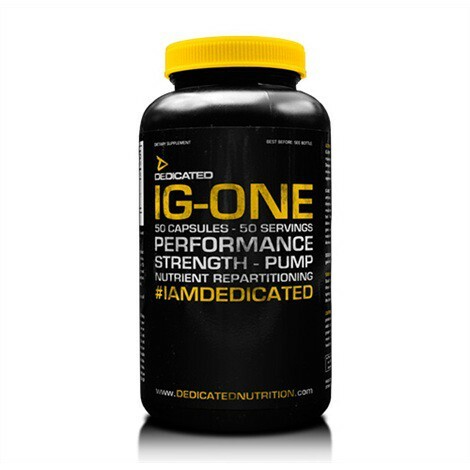 In true Dedicated Nutrition spirit, IG-ONE™ contains a fully disclosed formula. We do not have to hide behind fancy “proprietary blends” that basically do not tell the truth about actual ingredients and dosages. By actually controlling the cultivation of our own ingredients, we at DEDICATED can guarantee an industry leading standard untouchable by anyone else. We also guarantee a constant quality with each and every batch, something that is unheard of as well with any herbal formulation available today. 1 capsule is all it takes for IG-ONE™ to transform its user instantly into a powerhouse of performance, strength, endurance and ignite an anabolic muscle swelling pump unlike ever before. Be it for fat burning or to build monstrous muscle mass and strength, IG-ONE™ works every single time and for 6 hours upwards. Effectively creating the ideal anabolic window before, during and post workout! IG-ONE™; eat more, lift more, push more, gain more. Take 1 capsule 15 minutes before breakfast or any meal with a minimum of 60 grams of carbohydrates. SUGGESTED USE ON TRAINING DAYS: Take 1 capsule 15 minutes before your pre-workout meal consisting of minimal 60-100 grams of carbohydrates. Or, ideally, use in conjunction with 3-6 scoops of #GAINZ for a record breaking workout. 2 separate servings may be taken each day with a minimum of 6 hours apart. Gelatin, Magnesium Stearate, Sunset Yellow (E110), Ponceau 4R (E124), Brilliant Blue E133. 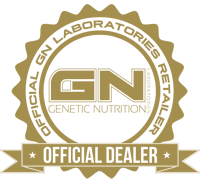 Weiterführende Links zu "Dedicated Nutrition IG-One 50 Kapseln"
Kundenbewertungen für "Dedicated Nutrition IG-One 50 Kapseln"
KURZES REVIEW zum IG-ONE von Dedicated Nutrition. Habe die 25Tage hinter mir und denke ich kann ein aussagekräftiges Fazit zu dem.Produkt schließen. Es hält nahezu alles was es verspricht. Es soll die Aufnahme der Nahrung optimieren , die Kraft soll steigen und auch das Körperfett soll reduziert werden. Habe mit 82.5kg begonnen und bin jetzt bei 85kg. Man fühlte sich allgemein über den Tag sehr energievoll, kräftiger , "praller" und hatte verbesserten Pump. War definitiv nich meine letzte Dose!